Paintings from Feldschuh's "Large Hadron Collider" series, inspired by the Geneva particle accelerator where the Higgs boson was detected, appeared as a window display at Mixed Greens Gallery in New York’s Chelsea neighborhood last year. This fall, "The World Egg", a series of radiation maps of the universe, was on view at the Gallery at Skink Ink Editions in Williamsburg, Brooklyn. I spoke with him in his Chelsea studio this October. Ashely Taylor: You have a B.A. in physics from Harvard. 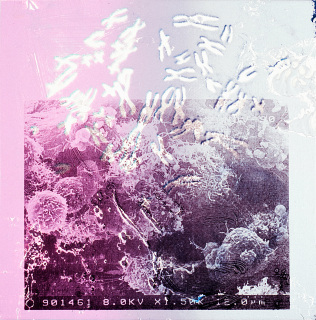 How did you get into science-based art? first chapter so I couldn’t return it - and I just had this epiphany, if you will, that the answers to the questions of physics, and just physics, were not the answers I was most curious about exploring with my life; that even if I were to walk down this path and achieve the great success of these people, it wouldn’t feel like what I wanted to do with my life, so I walked away from that class. I spent the rest of my last year and a half at Harvard in the painting studios, in the dark rooms. My senior year, I handed in my course list to my adviser in the physics department, and he said, “But there’s only one physics course on here,” and I said, “Well, yes. I’ve finished my requirements, and I’m going to take all these other things that I’m interested in,” and he said, “Well... if this is your program for your senior year, we’re not going to take you at the graduate school, and no one else is going to take you.” That kind of made me gulp, because I realized that even before I thought I had to, I needed to commit myself, that I wasn’t going to become a physicist, and so that was it. "Large Hadron Collider #20" (2010). 36" x 84". Acrylic and pencil on mylar. Image courtesy of the artist. AT: When telling that story, you said that physics wasn’t giving you the answers you were looking for. What were you, or are you, looking for? JF: What are the questions, in other words. I guess the questions are more metaphysical ones. What does it mean to be alive? What is our purpose? What can we express or share about the fundamental questions of how we live as human beings? To me those are humanist questions, and the questions of the Grand Unified Theory and the ultimate structure of matter are fascinating ones, but I felt like I personally didn’t want to spend my life working exclusively on them. 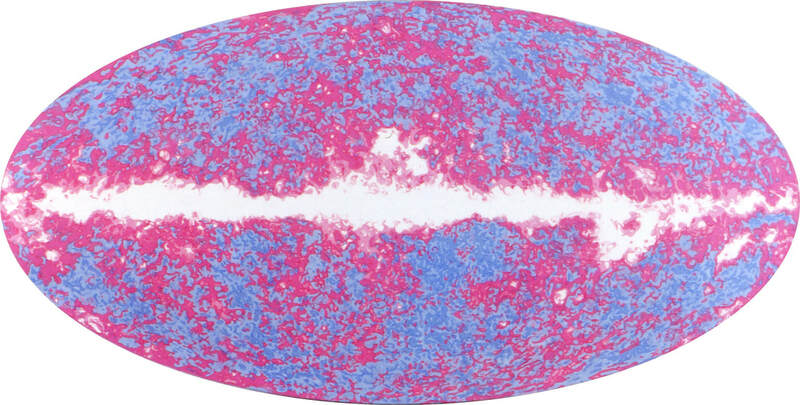 "Universe Baby Picture – Planck #1" (2013). 24” x 36.” Archival giclée print on Hahnemühle museum etch- ing paper. Image courtesy of the artist. AT: When you first became an artist, did you imagine that you would end up painting about science? JF: No, I didn’t. I started out as an abstract painter. At the start, it really felt like I had to choose one path. Clearly science was only viable if I were willing to devote myself to it completely, and art seemed to be indifferent to science, so there didn’t seem to be a possibility of reconciling those two worlds - C.P. Snow’s “Two Cultures” idea. I threw myself into art with all my energies, but I think as an artist, you have to make work that’s authentic to you and comes from your way of seeing the world. Clearly science shapes the way that I see the world, and that viewpoint is something that I came to see as relatively unusual in the art world. My engagement with these projects of big science is a particular thing that I have to offer, and it just came to be clear that was what my work should be about. My interests as a painter seemed to have many scientific themes underlying what was there in terms of how the natural processes of mixing paint creates forms by themselves - what would have been called “process art” at some point. My first solo show in New York was called "Little Corner of the World," and it was about how the forms that arose out of chance operations could be reminiscent of organic forms at any scale. It was related to the idea of fractals - of how when you see something, the same structures get repeated at different scales, so I would use chance spills and forms that arose from things I wasn’t controlling and elaborate those forms into three-dimensional structures that were interesting to me. Those structures looked like microscopic plant life or animals, strange things of an indeterminate scale. As I tried to articulate what my ideas were as a painter, it became clear to me that I was incorporating ideas from science. So my next show, "Macrocosm," was about looking out into space, the wider universe, and seeing things that we can’t see with our naked eye - Hubble Space Telescope images of incredibly distant things, images of planetary bodies from satellites that we sent out, all of which I painted in this same kind of swirling technique. The stroke of each layer of oil paint on top of one another has a certain kind of appeal, and I thought, “Actually, I’m interested in this idea that paint is liquid; paint is a dynamic flowing substance that can represent all kinds of dynamic, flowing substances, in particular, the universe.” At all different scales, the universe is made up of dynamic flowing substances, whether it’s the gas in a nebula or the clouds that make up a hurricane or the tiny bits of watery fluid that make up a living cell. So I felt like the same techniques that I’d created in this abstract painting world were ideally suited for investigating scientific images in this way. "Large Hadron Collider #24" (2009). 36” x 84”. Pencil and acrylic on mylar. Image courtesy of the artist. 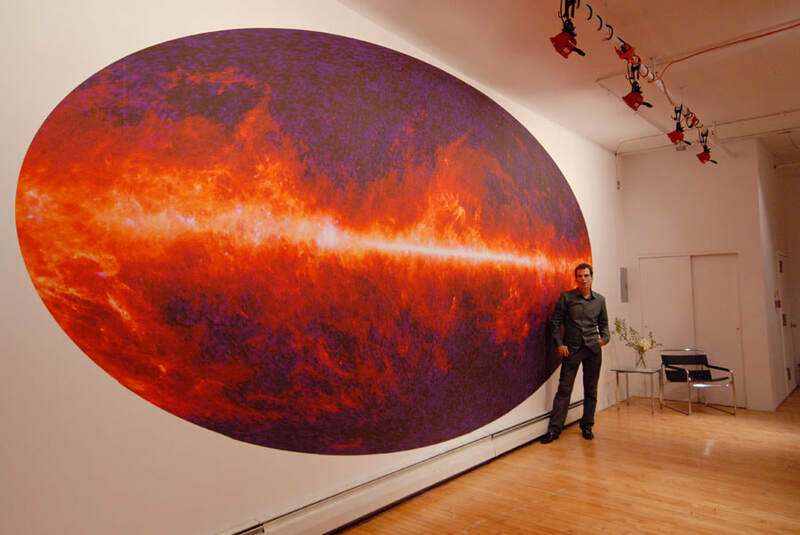 AT: Could you talk a little bit about how you made your "Large Hadron Collider" paintings? JF: In the "Large Hadron Collider" series, I’m using transparent mylar as the surface support. I’m making a pretty realistic architectural rendering of the Large Hadron Collider (LHC) on the front of the mylar. On the back of the mylar, to show through, I’m making a very spontaneous action painting that represents the events the collider is allowing us to see in a very schematic or conceptual way - clearly there isn’t an obvious representation of the Higgs boson or anything else that’s built into these depictions; what they’re showing is just the pure force of the collisions. AT: Did you actually throw the paint? JF: Yeah, I do pretty much throw the paint. Typically the process is first I’ll make the drawing, and then I’ll paint a little bit of the structure, and then I’ll turn it over to the back side, and I will literally climb up on a ladder, mix buckets of paint, and heave them onto the paper and just let them dry how they will. AT: Why did you choose to paint on mylar for these? JF: I like its association with architectural presentation drawings. If you go to shows, say, of the architecture department of Museum of Modern Art you’ll see that architects working during the early to middle part of the 20th century used mylar to make their presentation drawings - often, almost at this scale, a big concept drawing of what they’re trying to achieve. It’s a material that allows you to work very wet, because it accepts wet and dry medium - but only reluctantly, and I like the resistance that it provides. Also, I like the transparency of it, because part of this project is to balance the solidity of the detector, which is this hulking machinery, with this ephemeral explosion that’s happening - to equate those two layers. Also, my signature style, which I used for the previous series, involved a lot of transparent layers of acrylic paint. Using mylar gives me a lot of formal possibilities in terms of painting on the front and the back sides, and the ability to do an isolation layer. "Large Hadron Collider #31" (2011). 36" x 84". Acrylic and pencil on mylar. Image courtesy of the artist. AT: I read in one of your artist statements that you envisioned the collider as a cathedral, and this made me think of stained-glass windows. JF: Yes, there is that reference. There’s this famous quote from the late Victor Weisskopf, who served as director of CERN in the 60s, that these colliders were the cathedrals of the 20th century, and I really like that. I find that a very inspiring quote in the sense that cathedrals represented a huge collective undertaking that often spanned generations of time to build, huge expense, and the creation of something that was about beauty or transcendence or spirituality, something whose purpose was ineffable; they didn’t have a practical purpose beyond the needs of the spirit. One of the things I like so much about the LHC is that it’s an optimistic statement of what we can do as a civilization, as a species together - thousands of scientists, from over a hundred countries, all working on this project that has no military applications, no commercial applications - it’s really about the pursuit of pure knowledge, and that gives me hope that we can tackle other problems that seem unmanageable. AT: What motivated you to do the "World Egg" project? JF: As part of the "Macrocosm" series, I was painting images from various orbiting observatories, and at that time, in 2002, one of these observatories was the Wilson Microwave Anisotropy Probe, WMAP; it was a NASA satellite that was observing the cosmic microwave background radiation. The idea was to launch a satellite, send it up, and have it take microwave images of the entire universe and then subtract all of the microwave foreground radiation. Somehow there’s radiation everywhere, and that’s what you see, the echo of the Big Bang, and they published this image that was the product of subtracting the foreground to just see the background. 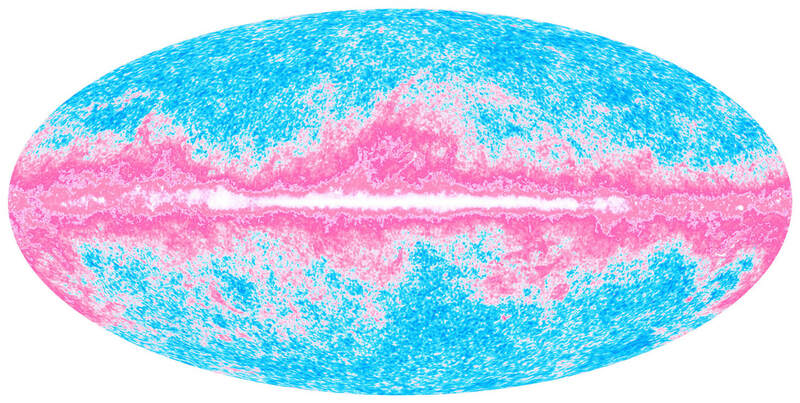 People started calling this a baby picture of the universe. "Universe Baby Picture" (2002). 72” x 36.” Acrylic paint on canvas. Image courtesy of the artist. Flash forward to 2012 when the Planck satellite, which is the European Space Agency’s successor to the NASA probe from a decade earlier, released its much higher-resolution image of the universe baby picture. 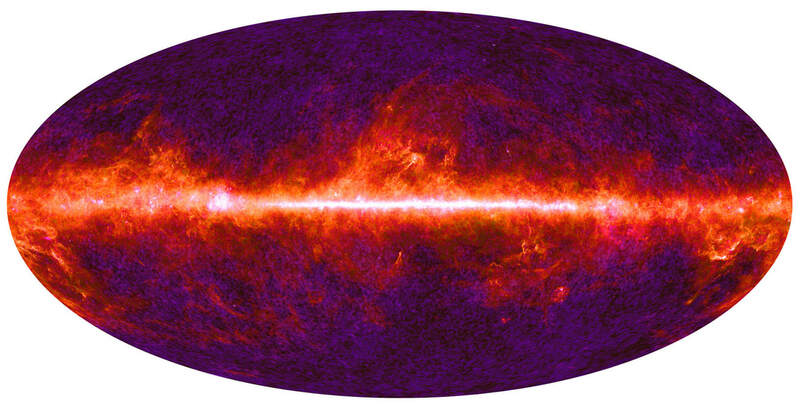 I looked at the differences between the Wilson images and the Planck images, and the biggest difference was just a huge increase in resolution, and one of the things that my earlier series was about was the way the limited resolution of some of those earlier images played out in paint. There were all these swirling and chaotic interactions that happened during the process of painting, which I accentuated and drew attention to by making three-dimensional forms. I was adding in noise and chaos. For the first time, I did astronomical image making in an orthodox sense - I downloaded gigabytes of raw data from the observations, processed it using astronomical software, and made my own composite image - so instead of starting with a published image and making a new painting from it, this time I started with the actual data and made a new visualization from it. In that sense, my visualizations are completely scientifically valid, although obviously, I’m motivated by different things, perhaps, in terms of my reasons for making it and what I’m trying to achieve. One of the things that I like to think about and show in my work is that the colors that we use to display scientific images are arbitrary. Scientists know and acknowledge this, but what they don’t spend a lot of time thinking about is that when you color an image, it resonates in the world of images, which is an incredibly rich, nuanced, and sophisticated way of communicating information. Color has many associations and meanings, and scientists usually limit themselves to a very restricted range of choices, perhaps either because they don’t want to deal with those associations or because they are oblivious to them; but the way that we process images is in relation to an immense stored database in our heads or shared experience of making images, so a lot of my work is showing how a particular color choice for an image will change its meaning and its resonance. AT: Is it important for people to see the work through a scientific lens? JF: I think the underlying themes are consistent between the scientific work and the abstract work. I’m happy for people to respond to different series in different ways. I think that’s only natural. "Microwave Universe" (2013). 24"x36". Archival Giclee Print on Hahnemühle Museum Etching Paper. Image courtesy of the artist.